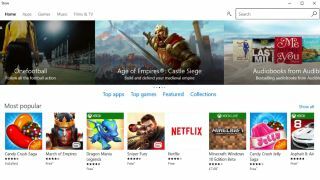 Microsoft has changed the way large games and apps are installed from the Windows Store, so users can now select which drive they wish to use rather than being stuck with the default. This is a pretty basic feature that should have been in there from the start, to be honest, but at least now it's arrived – in preview versions of Windows 10, that is. Insiders testing Windows 10 are able to pick which drive they want to install their app or game on, providing it's a large download (smaller apps will still install automatically on the default system drive). This works on preview builds 14361 and 14366 of Windows 10, Neowin reports, and quite possibly others. But also note that you only get to pick a drive (any drive), you don't get to specify a directory or anything further. Still, for those with multiple drives, and perhaps a small system drive – it can often be the case that folks will use a small SSD for the OS and primary apps – the ability to freely choose which disk to install a huge game on is an obvious boon. Presumably this feature will be going live on the full release of Windows 10 with the big Anniversary Update coming next month, so even if you're not a tester, you've not got long to wait now.